Spoiling myself, on the cheap. For someone who likes to boondock solo, this is my second commercial camp stay of the trip (and the year). 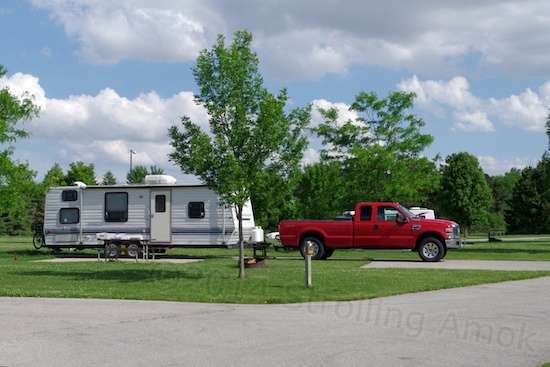 Actually, it’s the Bald Eagle Campground in Scott County Park, and there are several campgrounds in this very sizable park. The attractions: level, concrete pads, full hookups, and balky free WiFi. The overnight heat and humidity the last couple of days have been getting to me, and for $21/day for enough power to run the air conditioner, electric elements of the water heater, and the computer and TV, I’m sold. This evening, I shall be Mr. Stinky no more. 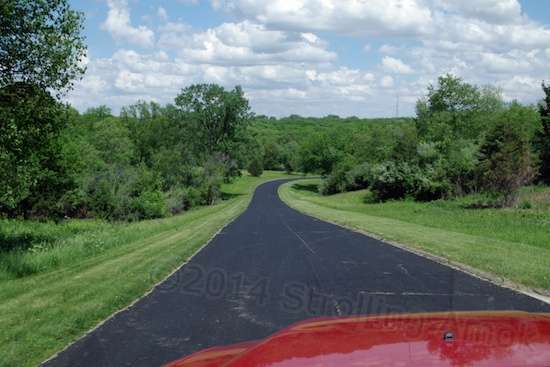 A perfectly paved road wanders through the entire park. Iowa is so GREEN!